When: April 26, 6-8 p.m.
To celebrate National Poetry Month, join us for an hour of poetry writing followed by an Open Mic session where young writers will be encouraged to share their work. 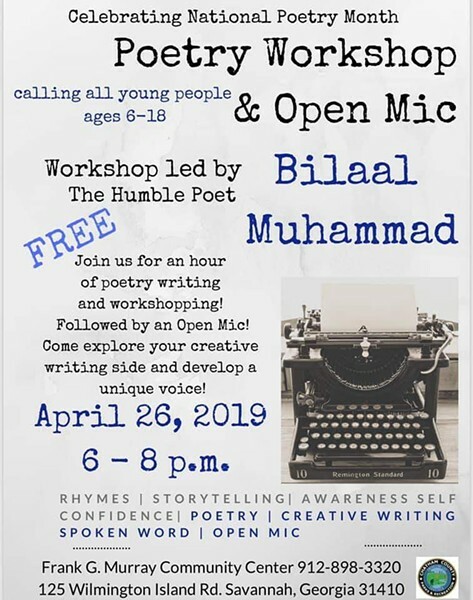 This workshop and Open Mic will be led by Bilaal Muhammad, "The Humble Poet". Youth ages 6 -18 of all writing levels are invited to attend. Sponsored by Chatham County Parks & Recreation Dept.